Difference Between Game Consoles and Pixar Tech? "Vast." Current gen video games look pretty darn good! Almost like movies. But there is a difference. 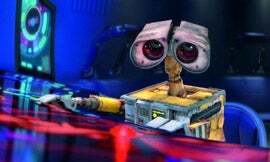 Ask ask Ralph Eggleston, production designer behind Pixar's upcoming movie, Wall-E (pictured). He'll tell you! How much of a gap exists today between current-gen consoles and the tech you use? A vast, vast difference. If the player is involved in the narrative they can render it only so fast, really, though it will get faster. But when you're in control of a narrative, as we are as filmmakers, the level of detail has to be much greater and we have the opportunity to create that because we have full control – our worlds are finite as opposed to video games, which are not entirely infinite but a lot more infinite than what we do... I think it will get better and better. But for me, the big thing lacking in video games, and I haven't seen one that has done this for me, is how you involve a strong narrative story. Not just a set-up that you jump in to, but a narrative story in which the player is an active participant. I've had this conversation with friends now for almost a decade on how you could actually do that with a videogame. Unfortunately, although I think there would be a market for that, I don't think the market would be large enough. M'kay. If it's good, Ralph, people will buy it. Don't underestimate your fellow human!